Chambers of Flavour just got spicier! 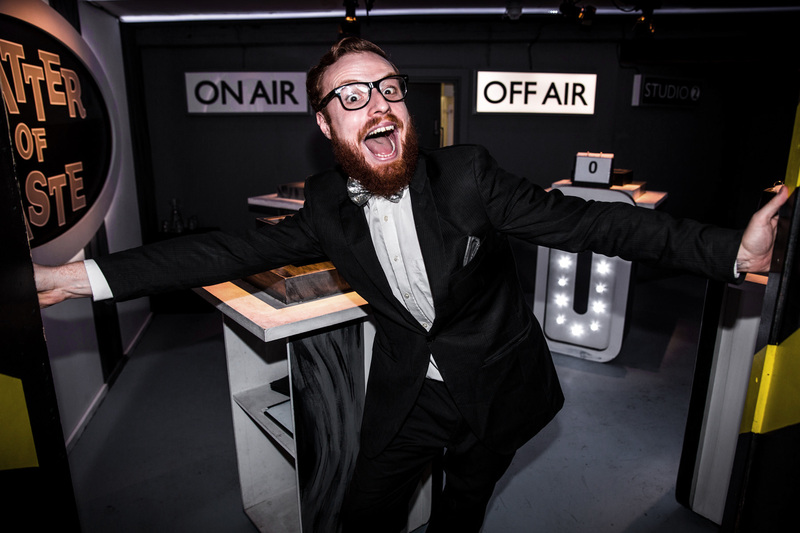 Gingerline are an amazing bunch of food and drink enthusiasts, whose goal is to create unforgettable immersive theatre dining experiences. We love working with these guys because they’re not afraid to make each experience more adventurous and creative than the last. 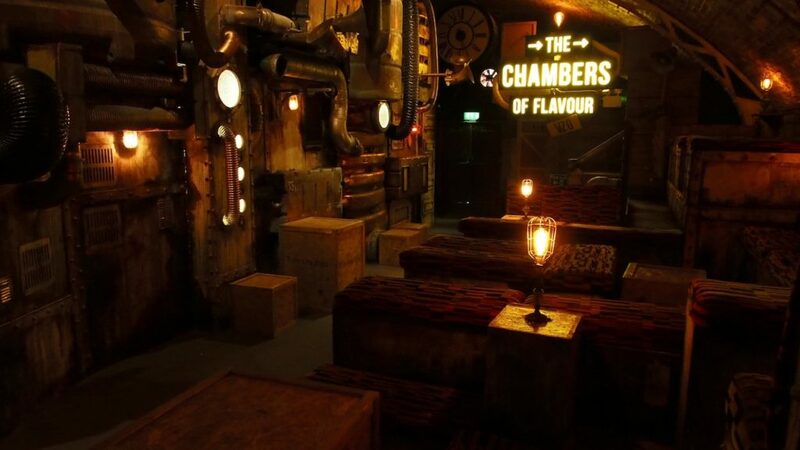 ‘Chambers of Flavour v2’ was no exception. We were chomping at the bit when they asked us to work with them again after the success of Chambers of Flavour v1. Inside a Gingerline experience, people go on flavour adventures to unique, wondrous places. They needed lighting to enhance the designers’ visions for each of the ‘Chambers’. The chambers are small, so they needed discreet lighting that wouldn’t intrude on the set. Off-the-shelf kit would be too big, so we would need to use lots of custom or repurposed kit, which we love. And the design would need to run automated, while staying interactive in places. In we go! In the Gingerline universe, ‘the machine’ takes audience members through time and space to start them on their journey. Inside the machine, we installed 5 volt pixel LED tape, which uses the WS2811 protocol, and controlled it using a modified Raspberry Pi. With some cunning code we sent light patterns along the machine, giving the audience the effect of plunging deep inside it. The next chamber was the set of ‘A Matter of Taste’, a 70’s gameshow. To keep the room in black and white, we used almost exclusively cold, white fixtures. Six strips of white LEDs crossed the ceiling and white Cabochons lined the contestants’ podiums. All of these we could control individually to create dynamic effects. We built ‘trigger buttons’ out of a product we developed using a Raspberry Pi, allowing actors and audience members to interact with the experience. When someone pressed a button, it made a connection on the GPIO header, which sent an Open Sound Control (OSC) command to the show’s main QLab server. The machine started to malfunction in the ‘Lost Room’, so we kept the room dark and moody with cold white light throwing shadows on the set. But we transitioned to a softer and warmer lighting state as the scene progressed, using squirrel cage filament lamps. We used another Raspberry Pi using the WS2811 protocol, this time to control pixel fairy lights. The fairy lights’ intensity could increase as the audience peddled faster on bicycles to start the machine back up. Working with Gingerline was an incredible experience. We managed to blur the boundaries between the senses, helping to create a memorable and totally immersive flavour journey. We were chuffed with the feedback too, a lot of the diners who experienced Chambers of Flavour v2 were utterly thrilled. Our customised and discreet lighting really emphasised the amazing design of the chambers, in spite of space limitations. And we gave the actors and audience members a real way to interact with the design. We were also delighted to get to work on this year’s new ‘v3’ (which for contractual reasons we’re not allowed to talk about yet – shh). To find out more about how we can help you create an unforgettable experiential event, get in touch.